The Daruma Buddha spent many years in a cave until his arms and legs dropped off (hence the roundness of this figure)! But eventually he reached enlightenment. These little "Daruma's" figures are used to indicate hope, goal or aspiration. 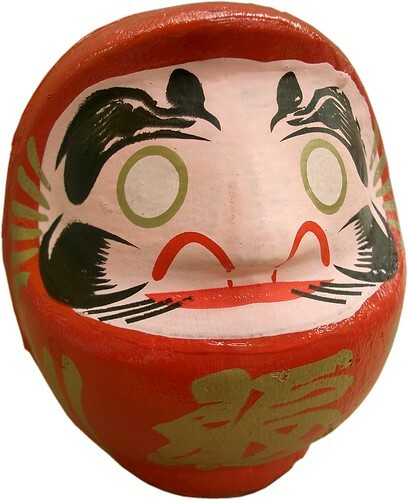 When one buys a Daruma, neither of the eyes is blacked in (as in this picture), suggesting that one has not yet set ones goal. Then one colours in one of the eyes meaning that one has set ones goal. Then if one reaches ones goal, one colours in the both eyes, meaning that your Buddha has reached its goal/enlightenment. They are usually found in the offices of people running for elections, or above the desks of high school students attempting to get into a good university. I have cut this one out, so the background is white.